At this moment, the space you occupy is shaking from a background of gravitational radiation. You are being stretched and squeezed in all directions by gravitational waves from the most distant reaches of our universe. Gravitational waves are ripples in the fabric of spacetime caused by the violent acceleration of extremely massive astrophysical objects, but you don’t have to worry about getting ripped apart by gravitational radiation anytime soon; by the time these waves reach Earth, the spacetime distortion they cause is less than the diameter of a proton. Because these signals are so weak, it takes an extremely sensitive instrument to detect them. The Laser Interferometer Gravitational Wave Observatory (LIGO) consists of a pair of 4-kilometer-long, L-shaped lasers that use the characteristic interference pattern of the laser light to detect when a passing gravitational wave has squeezed one arm and stretched the other. The LIGO Scientific Collaboration announced the first direct detection of gravitational waves from a merging pair of black holes two years ago, exactly one hundred years after they were first predicted by Albert Einstein’s Theory of General Relativity. This was such a monumental discovery that the scientists who first designed the experiment were awarded the Nobel Prize in Physics in 2017, while I was serving as a Fulbright Postgraduate Scholar at Monash University in Melbourne, using LIGO data to study the gravitational wave background. This background arises from the overlap of many gravitational wave signals that are too weak to be detected individually. An individual black hole merger would go undetected if it’s not close or massive enough, but a chorus of them scattered throughout the universe would produce a persistent hum that might be loud enough for the detector to hear. Together with colleagues at Monash, I worked on implementing the optimal method for detecting such a binary black hole background, developing the tools to run the search and experimenting on mock data. Merging black holes won’t be the only source contributing to the gravitational wave background, though. This background could also be cosmological, a relic of the turbulence in the early universe immediately following the Big Bang. The cosmological contribution would be much weaker than the astrophysical contribution from binary black holes, making it even more difficult to detect. While at Monash, I worked on developing a method to search for and measure both of these contributions simultaneously, a project that is still ongoing. My time at Monash served as an introduction to many of the techniques I will need throughout the rest of my PhD, which I have just started at the Massachusetts Institute of Technology. 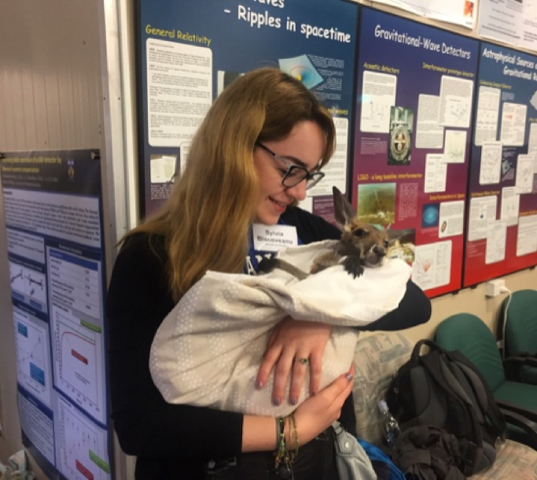 During my ten months in Melbourne, I learned so much not only about Bayesian statistics, gamma-ray bursts, stochastic backgrounds, and signal processing, but also about how to guide my own research and pose compelling research questions on my own. I have made invaluable connections with other researchers at Monash and in OzGrav: The ARC Centre of Excellence for Gravitational Wave Discovery, and these are collaborations I plan to continue now that I’ve returned to the US. I also had the opportunity to share my passion for gravitational waves with the broader community. I organized a series of outreach activities for local year 10 students, teaching them the basics of gravitational wave data analysis and interferometers. I gave song to that chorus of merging black holes with my supervisors, Dr. Eric Thrane and Dr. Rory Smith, on ABC’s The 7.30 Report. I presented a TEDx talk on gravitational wave backgrounds in Canberra. Together with another postgraduate student at Monash, I started a mentoring program for women in physics and astronomy at all stages of their careers, from undergraduates to faculty, bringing over one aspect of my undergraduate education that led me to ultimately pursue a career as an astrophysicist. In addition to my research on gravitational waves, I was also able to pursue my passion for music. I played violin in the Monash Academy Orchestra, gaining exposure to the works of Australian composers under the baton of top Australian conductors. It was quite a shock having to ask my stand partner about crotchets, quavers, and breves during my first orchestra rehearsal, since we use different musical terms in the US! These opportunities allowed me to give back to the community that became my new home, and I have taken many aspects of my Australian home back to the US with me—13 boxes of Tim Tams, lifelong friendships, new professional connections, and a deep appreciation of the intradepartmental collaboration at Monash that made me feel so welcome.